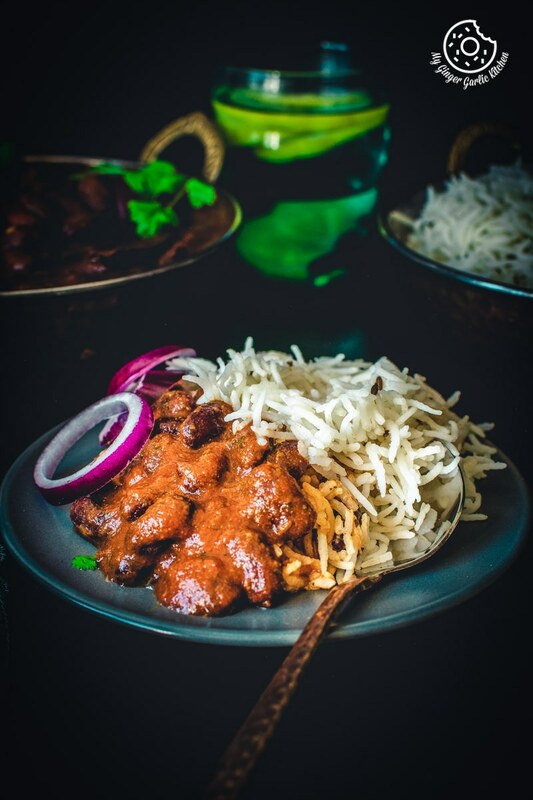 Learn How To Make Restaurant Style Rajma Masala | Punjabi Rajma Masala Recipe with a quick video tutorial. Rajma Masala is an extremely popular delicacy of Punjabi Cuisine. Just follow the simple directions to relish a hot Restaurant Style Rajma Masala under the coziness of your sweet home. Serve this curry dish with plain rice or with a Chapati/Paratha. 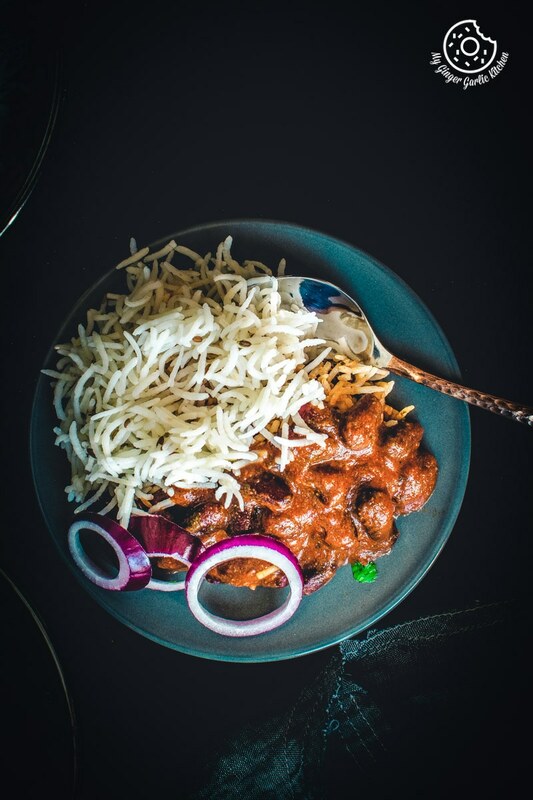 You boil the soaked rajma until cooked through, and then add it to a spicy tomato onion masala mix (bhuna hua masala) made with some aromatic essential spices. Then you let it cook for sometime, and this amalgamation of masala cooked with boiled rajma ultimately brings a nice aroma to the gravy dish. Rajma masala is a curry originating from the Indian subcontinent. Rajma Masala is a very popular dish in the Northern states of India. This is a thick bean curry made of red kidney beans. This tomato-based gravy dish comes with many Indian whole spices and usually served with rice. Rajma Chawal is a wholesome meal which is a part of regular Northern Indian diet. 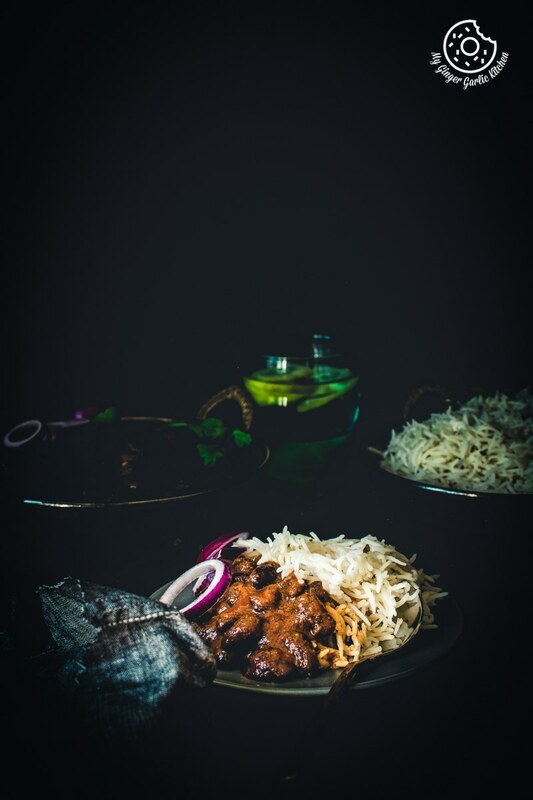 Rajma chawal is a dish where Rajma is a spicy curry which is served with steamed/boiled rice. 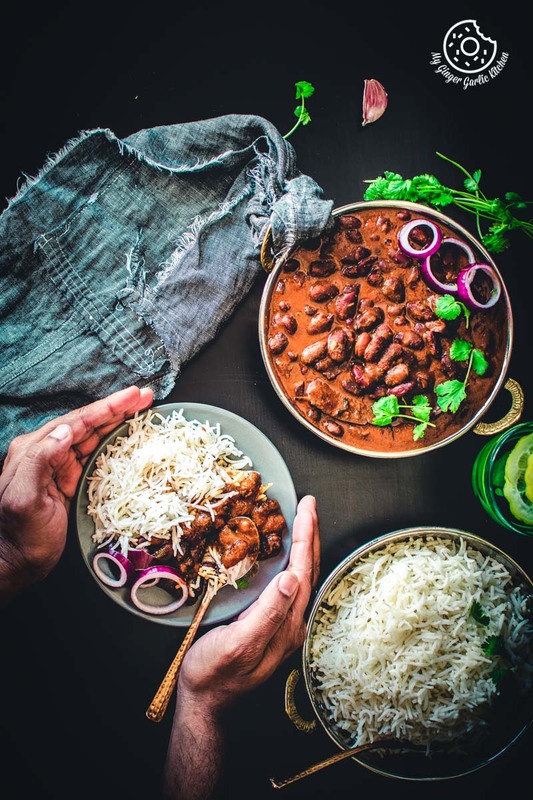 The combination of rajma and rice is very well-liked throughout northern India, giving it a universal name of ‘Rajma Chawal’. 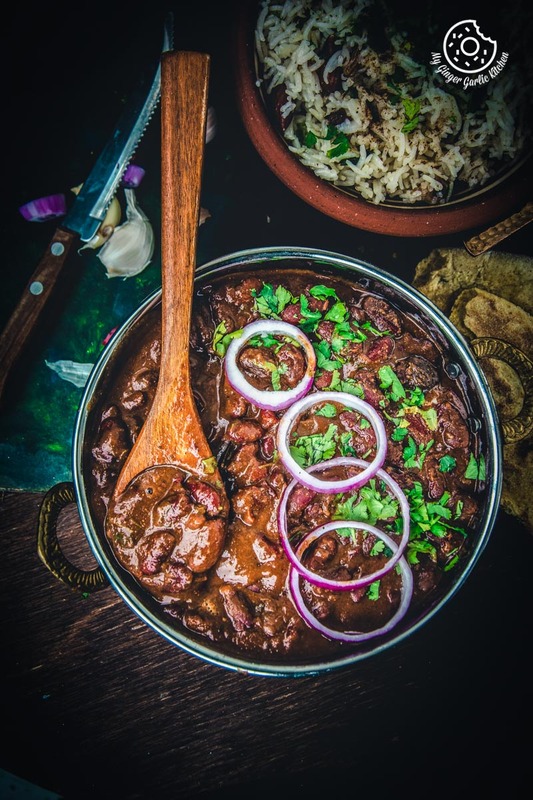 How to Make Best Punjabi Rajma Masala? 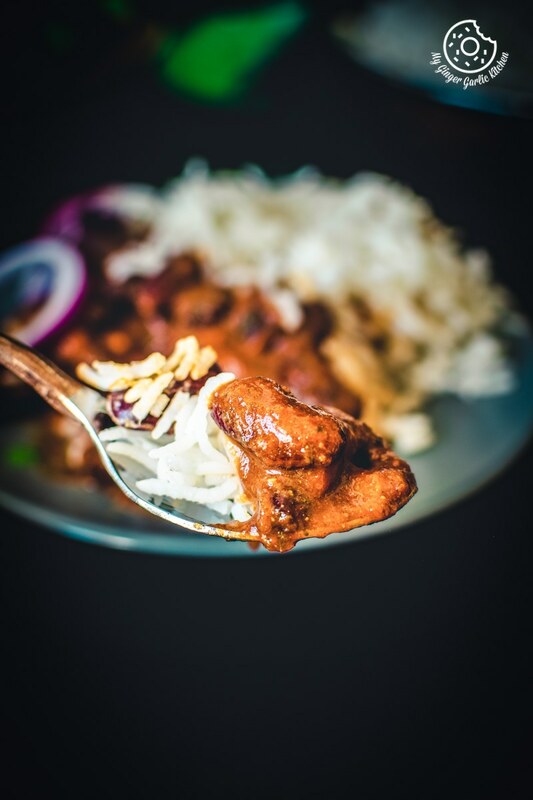 For making the best Punjabi Rajma Masala you’ll have to put a lot of love and very less effort in this dish. Punjabi Rajma Masala is cooked with the whole spices first and then simmered with bhuna masala till soft and mushy. This Punjabi Rajma Masala can surely make anyone drool, even the little picky eaters who are not so fond of beans and vegetables. You don’t need anything fancy to serve this ‘rajma masala’. 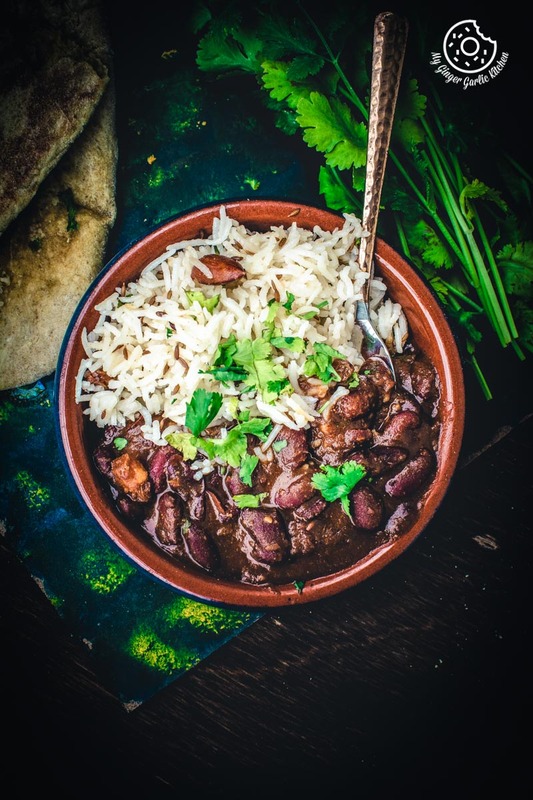 Simply eat this humble rajma curry with some steamed rice or any flatbread and get ready to fall in love with the deliciousness. Rajma is a Punjabi dish, and the authentic Punjabi way of cooking Rajma Masala is to soak it overnight in water. 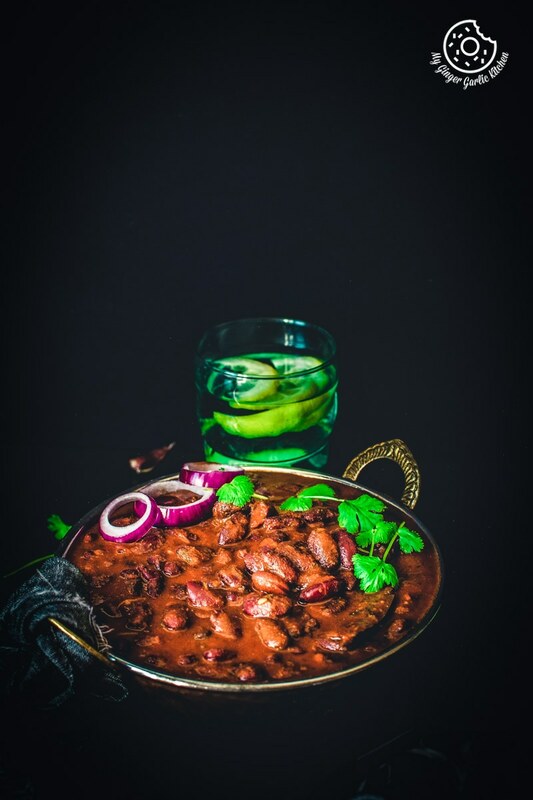 For the authentic recipe, It is very important to soak the rajma overnight. The next morning it doubles in size. However, you can soak rajma for 6-8 hours, or overnight as stated earlier. And in case you forget to soak the rajma, then there is an interesting rajma making tip for you which helps in cooking rajma without soaking it for a long time. How much time does it take to boil Rajma? It takes only 15-20 minutes if you are boiling it in a pressure cooker. But, if you are using a pan/pot for boiling, then it might take up to 45-50 minutes. When cooked in a pressure cooker, how many whistles does Rajma need? Usually, you need to cook rajma for 5 whistles, and then let the steam pressure go down completely before opening the lid. However, sometimes, this cooking time may vary due to the characteristics of local water, meaning hardness or softness of the water. What do we call Rajma in English? The English name for Rajma or Razma is kidney beans. Rajma is also a name of a famous vegetarian side dish. Is Rajma a pulse or a bean? Rajma is a bean, which has a classic kidney shape, that’s why it is also known as KIDNEY beans worldwide. Is Rajma and kidney beans the same? Are Rajma and red kidney beans same? Red Rajma is known as red kidney beans. How many types of rajma are there? Red Rajma (Red Kidney Beans): Red rajma are of the dark red color and they are highly flavored. They are available in small as well as big sizes. Another good thing about this rajma is that they hold their shape really well during boiling/cooking. They are perfect for those cooking dishes where simmering is needed. Kashmiri Rajma/ Jammu Rajma (Kashmiri kidney beans): They are small sized red colored kidney beans. They taste delicious and have a subtle aroma. You don’t have to soak this rajma overnight; soak them only for 4-5 hours prior to cooking. Chitra Rajma (Speckled Kidney Beans): These are either white or light brown in color. They are very soft in texture and have a more delicate taste. 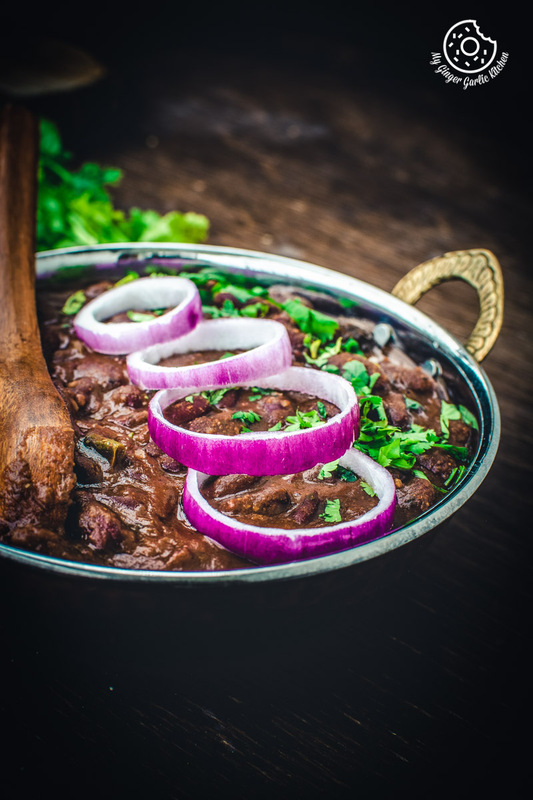 Black Rajma (black beans, pinto beans or navy beans): They are the common type of kidney beans, which are easily available in both small and big sizes. What else can I make with boiled rajma? Boiled Rajma can be used in many different ways, such as they make a great salad, or stuffing for a paratha or sandwich. They can also make a great cutlet, chaat, or stir-fry. You can also add this to soups, and pasta dishes, or Mexican tostadas. You may use boiled kidney beans for making a variety of rice recipes. Rajma can also be made with the combination of lentils and pulses. 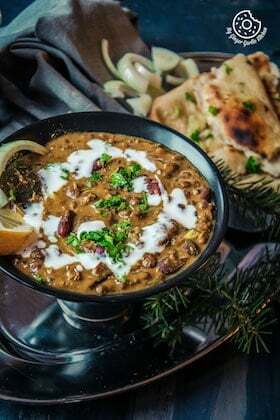 One of the other famous Punjabi recipes made with rajma and black beans is ‘Punjabi Dal Makhni’. You can also make 3 bean dal makhani, or 5 bean delicious & healthy curry recipe using Rajma beans. Rajma/Kidney Beans should always be kept in a dry airtight container at room temperature. This helps to secure their aroma and taste. Some people also like to store them in the refrigerator, but I personally prefer the ancient way of storing beans at room temperature. Boiled, soaked and cooked rajma beans can be stored in the refrigerator for 4-5 days. Rajma / Kidney beans help in controlling Blood Pressure. Rajma is also rich in Magnesium, so this can surely give you strong bones and teeth. Rajma is a complex carb and is rich in soluble fiber which helps in lowering the cholesterol and also reducing the absorption of cholesterol and LDL cholesterol. Thus this also reduces the risk of heart diseases. Rajma is a good source of zinc. That is why it is good for skin. It also helps in increasing your strength of immunity. 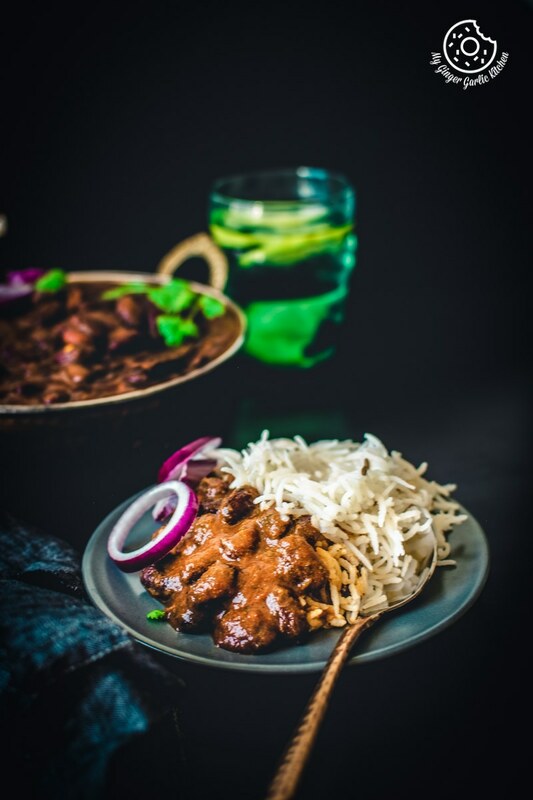 Rajma has a low Glycemic Index (GI), thus it helps in keeping the balance of blood sugar levels controlled, and so it is immensely useful for somebody longing for weight loss. 1. In a large bowl soak 2 cups of rajma (kidney beans) in enough water for overnight, or at least for 6-8 hours. 2. Drain kidney beans and rinse well in fresh water. 3. In a pressure cooker add the rajma, 5 cups water, bay leaf, cinnamon stick, and salt. 4. Stir and cook on high for 5 whistles. 5. Turn off the heat and let the steam pressure cool down completely. 6. Once cooled, open the lid and drain the water from the boiled rajma. 7. Rajma is cooked when you can smoothly press it between your thumb and index finger. Cook for some more time, if you can’t press the rajma bean. 8. Drain the cooked rajma water. Set it aside, we will use this reserved water later. 1. Heat 2 tablespoons of oil in a pan on medium heat, once the oil is hot add bay leaves, cardamom pods, cinnamon stick, and black cardamom. Saute for a minute. 2. Heat 3 tablespoons of ghee/oil in a non-stick pan on medium heat. 3. Once the oil is hot add the dried red chilies, cloves, peppercorns, black cardamom, and cumin seeds. 5. Add the onion paste and sauté for 3-4 minutes or until they are light brown. 6. Add the green chili and ginger-garlic paste and sauté for 2 minutes. 7. Now add the coriander powder, cumin powder, turmeric powder, red chili powder and mix well. 8. Add 1/4 cup of water and mix well. 9. Cook for 3-4 minutes. 10. Add the tomato puree and mix well again. 11. Let it cook for 10 minutes on medium heat. Stir occasionally. 12. Tomato masala is ready when there is no raw smell and oil starts oozing from the sides. 13. Add this tomato masala to the boiled rajma and mix well. 14. Cook for 2 minutes. 16. Cook for 3-4 minutes on medium heat. 17. Add chopped coriander leaves and stir well again. Cook for 5 more minutes. 19. Mash the beans slightly using a spatula mix well again. Turn off the heat. 20. Garnish with coriander leaves, onion leaves, and serve hot with steamed rice or chapati.